Get more out of selling your car in Raleigh, NC. Trading your car is the most common way to lose money at the dealership. 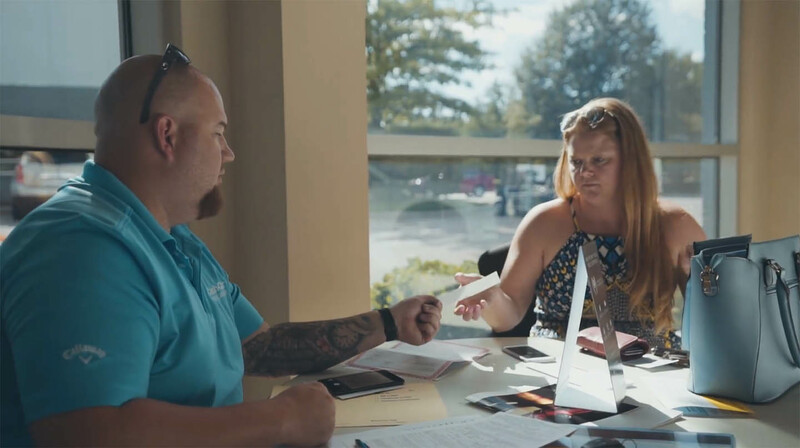 On the surface, it may seem like trading saves you time and money, but trading your car complicates the transaction more than you might think – and the odds are always stacked in the dealer’s favor. The solution is in separating the transactions – finding a buyer for your old car first, then purchasing a new one. Separating trade transactions allows you to negotiate from a position of strength to get the best deal for your trade-in offer. In this post, we’ll share tips and insights on separating your trade transaction to get the most money possible at the closing table. Step 1: Should you trade? The first order of business should be making sure you really do want to trade your car. Offering a trade-in severely damages your ability to negotiate the price of a new car. Dealers rarely want to accept a trade, since the cost of acquiring, cleaning, and re-selling a used vehicle can put a hefty dent in a dealer’s profits – meaning they’ll need to make up for that by either charging you more, or paying you less than your car is worth to accept the trade. It is profoundly more beneficial to separate the transactions – sell your car first, then use that money as a down payment (or bargaining chip) for a new car. This way you’ll never have to negotiate a trade at all. If you’re certain you want to trade your car, make sure to go into the negotiation prepared. This concept is a big, big deal. Trade dollars are not real dollars. If you’ve ever shopped around for a trade before, you’re likely familiar with the fact that your car’s “Trade-In Value” seems to be a moving target. Assessments from three different dealers are likely to yield three drastically different figures. Why? It’s the same car, isn’t it? Shouldn’t the trade-in value stay roughly the same? Simply put: Large discrepancies in trade-in values are often driven by what you’re paying for your new car. If a dealer offers a remarkably high trade-in value for your used car, it’s likely because they’re making a killing off of interest or mark-ups on the new car you’re planning to buy. So they can afford to pay as much as they need to make sure you go through with the trade. A dealer that lowballs your trade-in value may be selling you a new car for a reasonable price – and therefore can’t afford to buy your trade at full value, since it could cost hundreds (or thousands) for them to re-sell your used car. They’re free to do this because they know most people can’t say no to their trade-in offers. When you go into a trade negotiation, the dealer knows two things: One, you want to buy their car. Two, you likely can’t afford NOT to get rid of your old car – since two car payments is unreasonable for most folks. So they’ve already got you over a barrel. It makes sense, then, as to why trade values can be so all over the place – they know they have the ability to say whatever it takes to close the deal. Most consumers simply don’t have the option to turn down their offers. “No” is the most powerful thing you could say in a trade negotiation. Attaining a cash offer gives you the ability to say “no” to his trade offer. It means that, unless he gives you an offer that is reliably in line with what the true value of your car is, you can (and will) walk away. It forces the dealer to be honest about the value of your car, or risk losing a sale. Kelley Blue Book and certain individual dealerships have online tools to generate ICOs from a description of your vehicle. These offers usually only last a few days and are not redeemable at all dealerships, but they can help you zero in on the value of your car. If you have no other buyers, an Instant Cash Offer can certainly help at the negotiation table – but the power you need for a successful trade negotiation is the power to say “no,” and an automatically generated cash offer doesn’t always grant you that power. The most reliable way to know the value of your car is to get one (if not multiple) Offers To Purchase from buyers in your area. These could be private buyers, new car dealerships, or used car lots. The more options you have, the stronger your negotiation position will be. Once you’ve attained an offer to purchase, you can text a photo of the offer to one of our team members, and they’ll return a competing offer of $400 more than the existing offer. Get400More.com will beat any franchise or National Independent Dealer’s cash offer for your car. If we’re unable to pay you $400 more, we’ll send you money just for giving us the chance. After attaining your Offers To Purchase, you’re ready to find someone to trade with. You’ve likely already got a make and model picked out for your new car. Once chosen, do your research online to find two or three dealers who have an eligible car on their lot. It’s important to limit the personal information you give to dealerships or listing sites (like AutoTrader or CarGurus.) Keeping dealers at arm’s length will enable you to stay out of their sales traps and make an informed decision at your own pace. Favor written communication, like text or email. Written correspondence allows you to weigh your responses, ignore prying questions, and keep emotion out of the negotiation process. At this point, it’s best to leave out variables like financing and trades. Remember to keep the conversation focused. Once you have your prices, tell the higher offers that you have a better offer, and ask them to beat the best offer. This could go back and forth for days as the price gets lower and lower. Written correspondence is crucial to keeping the bidding war impartial. In addition to the emotional and communication benefits we already discussed, it also serves as a record of any price quotes or promises made on behalf of the dealer – so if they try to walk the price back up once you’re on the lot, you have a written record to refer back to. Keep your cool, stay focused, and don’t get caught up in their sales process. Most consumers are ignorant of the ins and outs of the trade process, and dealers rely on this to maintain the upper hand in negotiations. Low integrity dealers may even use misconceptions, omissions, or outright lies to corner you into a predatory trade. It’s impossible to predict every tactic that might be used against you, but doing your homework is the best defense against predatory situations. If you have low credit, negative equity, liens, or other extenuating circumstances that may complicate a trade, be sure to research how this may affect the negotiation. Don’t be forced into a trade if you don’t have to. Some dealers will insist you have no choice but to trade with them immediately. Most banks and credit unions only approve borrowers for one car loan at a time. This means that if your current car is financed, you may not qualify for a new car loan until your old one is paid off. It’s finally time to engage the dealer in the car buying process. When should you bring up the option to trade? Remember: Trades are risky for car dealers. If the dealer knows you plan to trade, they will modify the price of your new car to accommodate that trade. The best time to bring it up is at the closing table. Wait until the closing table to offer your trade. At this point, you should be sure you’ve secured the best possible price for your new car. Only then should you bring up the option of a trade. Show them the best cash offer you received on your vehicle, and ask them to beat it. Their “trade-in value” does not reflect your car’s actual value, and it’s likely that some numbers are being skewed in the dealer’s favor. You’re better off just selling your car to whomever gave you their cash offer. Be prepared to step out of the room to do research or make phone calls. All the steps you’ve taken so far have granted you the right to say “no” to a deal that isn’t the best you could get. Don’t be afraid to exercise that right. Your cash offers serve as powerful contingency plans in the event that a deal falls through. If your Cash Offer comes from Get400More.com, we’ll meet you on the lot with a check in hand. If the dealership simply won’t follow through with a beneficial trade deal, call us. We’ll meet you on the lot, buy your car, and you can continue the deal unimpeded. Step 1: Decide if you should trade. In nearly every situation, it is more beneficial to separate the transactions – sell your old car first, then buy your new car. Step 2: Get your car’s actual value via Offers To Purchase. Being able to prove your car’s value is the single strongest bargaining chip you could have. It allows you to say “no” to anything less than the best. Step 3: Choose a dealership to trade with. Don’t be afraid to shop around. Check online reviews and testimonials. Make sure your dealer is always up-front and clear with their communication. Step 4: Know common misconceptions and how to debunk them. Don’t be fooled. Know where you stand on your financial situation and be prepared to prove it. Remember that trading puts you at a disadvantage at the negotiation table. Make sure to clearly establish the price of your new car before introducing the wild card of a trade-in. Trading a vehicle isn’t as difficult as it may seem. With a little patience, diligence, and research, you can walk out of the dealership knowing you got the best possible deal.